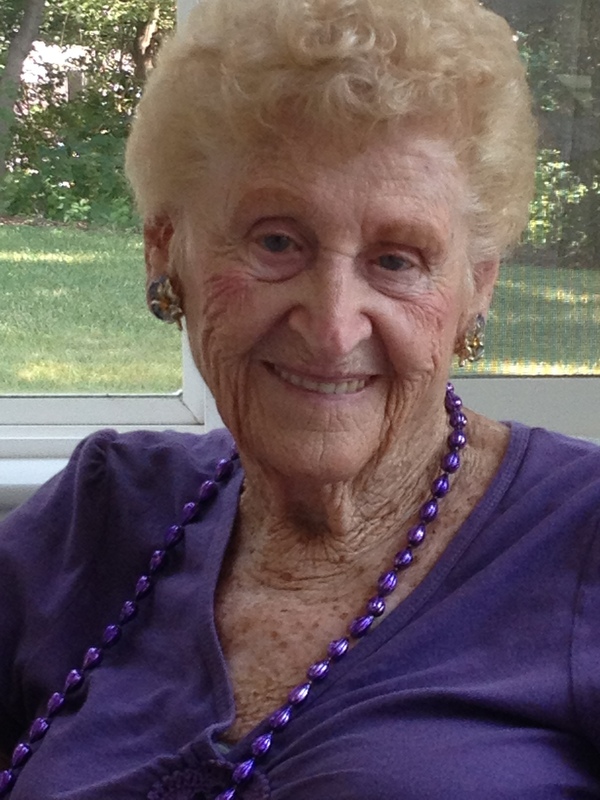 My Mom, Millie Harrop died on August 6th. She was 95 and ready to move on to whatever is next. Like most of us, she lived her life with a mixture of joy and struggle. She carried the memory of 55 years of marriage to Norman, my Dad. In each other they found strength and love. They complemented and understood the other. They knew they were better together than apart. When Norman died in 2000, his passing left an empty space that was never filled. To the best of her ability, Millie lived her life following Norman’s passing. One constant throughout was baking, particularly her apple pie. Her crust was famous. She was selective in the choice of apples, flour and pie tin used. Not one to write a recipe down, her pie making was instinctive, the result of decades of practice. The texture and taste of her crust and the crispness of the apple, with just a hint of sugar, would make your ears wiggle. The pie was that good. Millie was generous with her pies. To receive a pie was one way she let you know that you were appreciated, loved. It gave her pleasure to see others enjoy a slice, accompanied by a scoop of vanilla ice cream with a piece of strong cheese. Several weeks ago, knowing that Mom was drawing to the close of her life, my wife and I flew from our home in Massachusetts to see her in Florida (living near my brother). We gathered to say good-bye and offer thanks for the kindness’ shown. At her bedside any past wounds were let go of. Grace was found. I learned of Mom’s passing a few weeks later, when my brother phoned me in Montana. She had died that afternoon. The next morning I was leaving for a nine-day backpacking trip in the wilderness. During those nine days on the trail I had a sense of peace. Peace in knowing that our Mom had loved us to the best of her ability. Peace in knowing we her family and friends, had loved her to the best of our ability. What more can we ask of in life, than to love and be loved? My backpacking buddies (Bruce, Jock, Russell) wrapped up our trip with a dinner at Jock’s log cabin home. Deah, Bruce’s wife, had learned of my Mom’s practice of making pies for those she loved. We concluded our dinner with apple pie, a scoop of vanilla and a piece of strong cheese. Deah said: “I thought this pie would remind you of your Momma.” Yes. Thank you. It has been said ‘that a kindness offered is never forgotten’. The memory of my Mom’s famous apple pie will stay with me. The love that she baked into her pie will remain. And, the kindness of a pie shared with friends in Montana, with the memory of my Mom close by, will stay with me too. Grace abounds. Kids in cages: Our Joe McCarthy Moment? This is so honest and gracious. So poignant and so relatable. Thank God you can prices your mother’s passing with your closest friends. Thank you for sharing this with us. Karen, thanks for reading and for your kind words. Thanks too for all the kindness you bring to so many. 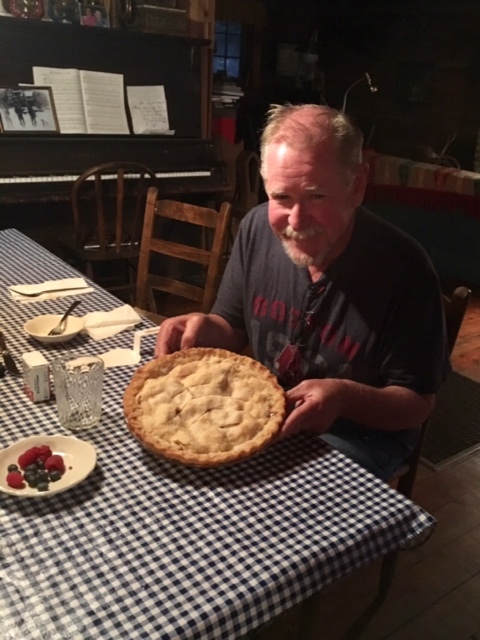 Thank you Kent, for the lovely tribute to your mom and to her apple pie! We just lost a dear one and it was good to hear your words about loving and being loved. When you get a minute, look up the song on YouTube…”We’re All Swimming to the Other Side.” It was beautiful song to play at a memorial service. Thankfully, you are well-loved by many. Cheryl, always good to hear from you. Thanks for your kind words. Sorry too for your loss. I’ll listen to Swimming to the Other Side. I love the title. wishing you well. Marge, thanks for reading and responding. Your mom, had a big impact on my life too. God bless Moms (and Dads). Marge, all the best to you and your family. Kent, I am sorry to hear about the passing of your Mother. Blessings. By the way- John loves apple pie, and it must smell awful good up there right now! Kent, I was sorry to hear of your mom’s passing. I remember hearing so many great stories about your mom and dad over the years. This is a beautiful tribute to your mom and so heartfelt. Thank you for sharing your wisdom and insights with us. Blessings to you and your family. Danny and I send our love.